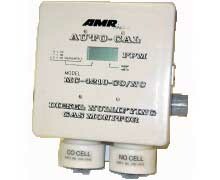 MC-4210-CO/NO | AMR, Inc. MC-4210-CO/NO | AMR, Inc. Designed to significantly reduce the nuisance alarms associated with using diesel equipment in coal mines. In addition to emitting carbon monoxide (CO), the diesel engine also emits nitric oxide (NO) in a CO/NO ratio of approximately 4:1. Using two gas sensing cells, the monitor employs the same CO sensing cell and circuitry used in the traditional MC-4210-CO gas monitor along with another NO cell and its associated sensing circuitry.